Dalginross sits in a small clearing, surrounded on three sides by trees and on one side by a quiet country road, beside the Muirend cemetery. The area is very peaceful, and the road quiet. Looking out from the circle, you are rewarded with magnificent views of the distant hills. 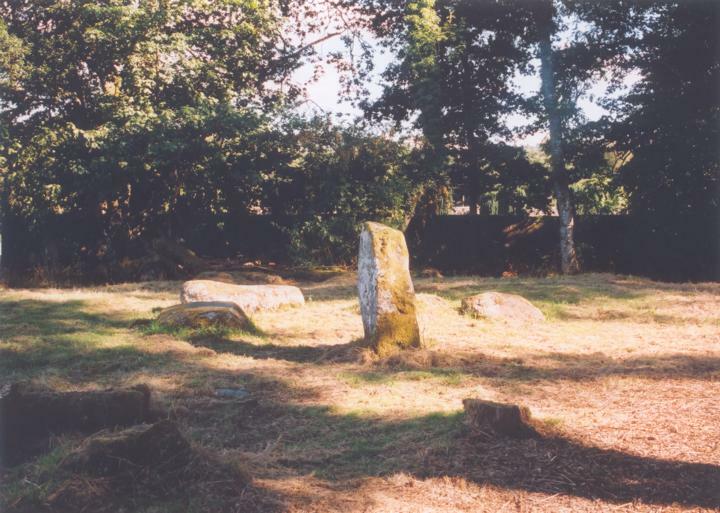 When Coles visited in 1911, two of the stones were standing, but now only one does, while the other three lie in approximately their original positions, encircling the stump of a tree at the circle’s centre. Standing back from the circle, it can quite clearly be seen that its stands on a slight mound, about 0.5m higher than the neighbouring flat ground. Dalginross is in the parish of Comrie and the county of Perthshire. Published on the 14th of May 2010 at 4:19 pm. Updated on the 31st of March 2011 at 7:07 am.